Come on, admit it. You know nothing about Microsoft’s flagship “groupware” and Lotus Notes alternative – Sharepoint 2010. The sad truth is, you probably have Sharepoint in your company. Its just that no one is using it effectively. Sharepoint is often seen simply as a “document library” – a place to store and retrieve files. What a waste. One of the most impressive values of Lotus Notes was that it empowered users build simple forms and worklows to track business functions. From customer service requests, to engineering tasks, to contract generation and approval – it allowed for a central repository of “work”. There was no “inbox overload” in Lotus Notes – everything a company did had a unique database to store and track the work. And Sharepoint offers companies the same – a single place to hold all work items within every department of the company. They can be tracked, measured, evaluated for effectiveness, audited to eliminate waste. All of which has the net effect of reducing intra-company email. And yet, the vast majority of Sharepoint installations go no farther that allowing users to search online for files. 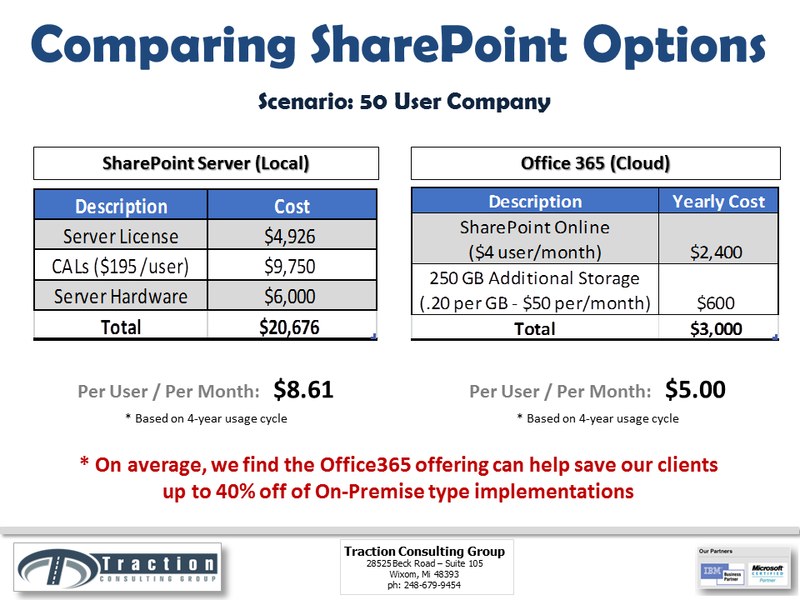 So why is Sharepoint treated so different? It offers our customers the same value as Lotus Notes – high-availability and security, scalability, and searchable meta-data indexes. Its the perfect centralized work portal for any company. Here’s the top 5 ways in which we’ve helped our customers reduce their intra-company email, and centralize all of their company work so that no one will ever “drop the ball”. Customer Service Requests – So often we see our customers emailing back-and-forth, discussing some form of question from a customer. However, when we ask them “how many” they’ve fielded in the last 30 days, or “how long” on average does it take to address them, they don’t know. The data is locked – missing inside of their various Inboxes.Instead, treat a Sharepoint issues list just like a Customer Service log. For every phone call or email that comes in from a customer, it gets centrally logged. If Q&A is needed amongst departments and co-workers, it is done directly from within the task itself. Sharepoint has many “alert” type functions already built-in. Track who a work order is currently assigned to, which have been “stuck open”, and how effective has customer support been. These types of metrics can go a long way towards delivering and documenting exceptional customer service. Instead of pushing product, push your value. Collaborative Proposals – Often companies need to develop a custom offering for their customers that requires the input of more than one person within the company. Maybe its a “special” one-off product, or some custom engineering that will be required in order to meet the customer’s specific needs. This often requires extensive collaboration across many phases – including fact gathering, brainstorming, solution development, cost analysis, value prop, proposal creation, and so on. Normally all of this communication would take place via spreadsheets and emails. However, by creating a centralized portal, with each proposal tracked and documented all along the way, you can ensure proposals are finalized with utmost urgency, and that no single person can hold up the process. Company Wiki – It seems every company these days has that one employee who believes “everything” is important. “That’s why they invented the FYI!” they say. Tell them NO MORE! Instead of sending an email to people who really don’t care, a Company Wiki can serve as a place that these valuable pieces of information can be stored, but not simply emailed around to people who don’t need to see them. Company policies, How-to manuals, Customer information, HR forms – it should all go in there. Add on Sharepoint’s great searching capabilities, and anyone with a need can find any piece of information they need. And more importantly – only when they need it. Vacation Request & Time-off Schedule – I can’t count the number of times that I find customers who send Calendar invites out to various departments informing them of an upcoming vacation. What’s worse is that by simply “accepting” these appointments, the recipient is unknowingly blocking out their Busytime for the exact same date/time.Instead, a simple Vacation Request form should be created. It can utilize built-in workflow inside Sharepoint to get routed (and approved) to the appropriate manager. Then, a Calendar listview can be created. This will allow anyone who wishes to “sync” the calendar into Outlook, thus automatically giving them visibility inside the Vacation schedule (without it clogging up their busytime). IT / Helpdesk Requests – Doing IT work can be hard. Its even harder when people constantly send you email informing you something “won’t work”. Without structure, it’s possible that 3 to 5 emails go back-and-forth before the IT resource has a clue on what the business user is talking about. What a waste. A customer of mine developed a saying – “No Work Order – No Work!”. It is a mantra that has served them well. Every request must first be logged by a user, and the Work Order form is comprehensive enough so that IT can tell what the issue is simply by reading it. Requests are then addressed in FIFO order based on priority and perceived downtime. The process has done more than decrease email coming into the IT department – it has also elevated the level-of-service, since IT now has 100% visibility across the organization. Sharepoint is an extremely powerful workflow tool, if set up and utilized properly. It can be a game changer in the way your company operates – ensuring 360 degree visibility across all work being done by all departments. And hey – it just might decrease you Inbox by about 100 emails tomorrow!